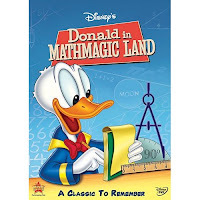 Disney's classic DONALD IN MATHMAGIC LAND (1959) comes to DVD on August 18th, 2009. Click the title of this post for an Amazon link. DONALD IN MATHMAGIC LAND has previously been released in the Disney Treasures set The Chronological Donald, Vol. 4. 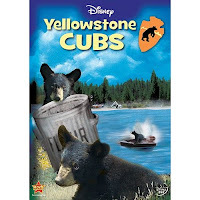 YELLOWSTONE CUBS (1963) also comes out on DVD on the same date. The Amazon link for the DVD is here. A new edition of PETE'S DRAGON (1977) is also out on August 18th. I think every girls' choir in the U.S. must have had "Candle on the Water" as part of its repertoire in the year or two following that movie's release! I love that Disney is making it's classic stuff available- I even think the Mathmagicland is great, even though it would a double dip for me- but not everyone collects the Treasures Sets like I do. I still wish we would get some Jiminy Cricket educational shorts on a collection, like we discussed before. Now, if we could just get everyone in the multipurpose room - command a rain storm and run the dvd's backwards - that would really bring back memories! Those were the (rainy) days! I'd forgotten about the thrill of being allowed to watch the movie go backwards at the end. LOL. Great, my kids love "Donald in Mathmagicland". They've had to watch it in parts on Youtube.